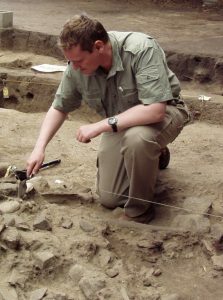 Alan Outram is an environmental archaeologist and palaeoeconomist who specialises in zooarchaeology. He studied for his BA in Archaeology at the University of Durham and his MSc in Environmental Archaeology and Palaeoeconomy at the University of Sheffield. He returned to Durham to undertake his PhD research on “The Identification and Palaeoeconomic Context of Prehistoric Bone Marrow and Grease Exploitation”. This research combined zooarchaeological analysis with experimental work. His most recent research has been on tracing the domestication of the horse in Central Asia (published in “Science” 2009), and the development of pastoral societies in Kazakhstan. He is also co-director of a fieldschool and research excavation on an early agricultural village site belonging to the Initial Middle Missouri Culture, in South Dakota, USA. Alan is the current Head of Archaeology at the University of Exeter and is the Executive Editor of the journal “World Archaeology”.